Non-member cost difference will be collected at the workshop. If you have experience etching with ferric chloride and are tired of waiting for hours for your etching to appear, electrolytic etching is oh-so-much-better. The process is less toxic, more precise and seriously faster - 60 minutes or less. 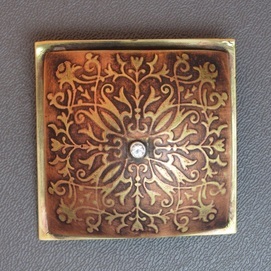 Beth Merckel studied metalsmithing at Revere Academy, Mendocino Art Center and Clear Creek Academy. She’s obsessed with texture on metal and her favorite tool is her rolling mill. Beth is the founder and Director of Boulder Metalsmithing Association.